When appendicitis, loss of employment, and a threatened divorce remove three flying friends from a long-planned flight to Alaska, the author sets off on his own. With the aid of his seaplane, the Tundra Cub, he dips a wing to polar bears, is surrounded by musk ox and caribou herds, searches the tundra for clues to the disappearance of a long-missing priest, and measures the earth like Eratosthenes at the edge of an arctic sea. More than a non-fiction travelogue, True North tells tales of John Hornby, the man who starved to death in the game sanctuary he fought to create, of a con-man extraordinaire named Soapy Smith, of unscrupulous missionaries, of life at early Hudson's Bay Company posts, and of the new Mother Lode of the North - diamonds. With tributes to the science that makes his flight and all of our comforts possible, the author communes with the fireside skull of "Unok" under flaring northern lights, illuminates plate tectonics at Great Slave Lake's McDonald fault - and twice almost loses his life. Following a course determined by weather and whim, Erickson damns wasteful habits that denude British Columbia forests, visits the troubled Sekani Indian settlement of Fort Ware, B.C., and returns to the 1898 Gold Rush at Dyea's Chilkoot Pass. Amidst an eclectic mix of engine failures, erotica, history, humor and mountain Shangrilas, he kneels on a Great Slave Lake shoreline composed of the organisms that filled our skies with oxygen and breathed us into life. Over-flying forest fires, he camps beside a tangle of rusting snares that liberate boyhood memories of death and grief. A blend of stunning landscapes, wildlife, myths and personal experience, True North reveals the author's love of nature and his passion for truth. 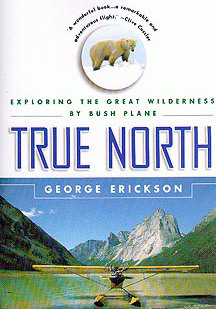 "Erickson is the spiritual descendant of the great explorers he writes about." - Chicago Tribune.